Growing population would have forced larger Scots towns to adopt new burial systems around the mid nineteenth century even without new ideas of what was appropriate and hygienic. By the 1850s, the Holy Rude Kirkyard was so overcrowded that older graves were regularly disturbed to make way for new burials; access to almost every plot involved trampling over others. in a style known as ‘gardenesque’ and characterised by copious planting of trees, by enclosure from the surrounding world and by statuary, pools and other features found in fashionable gardens of the period. 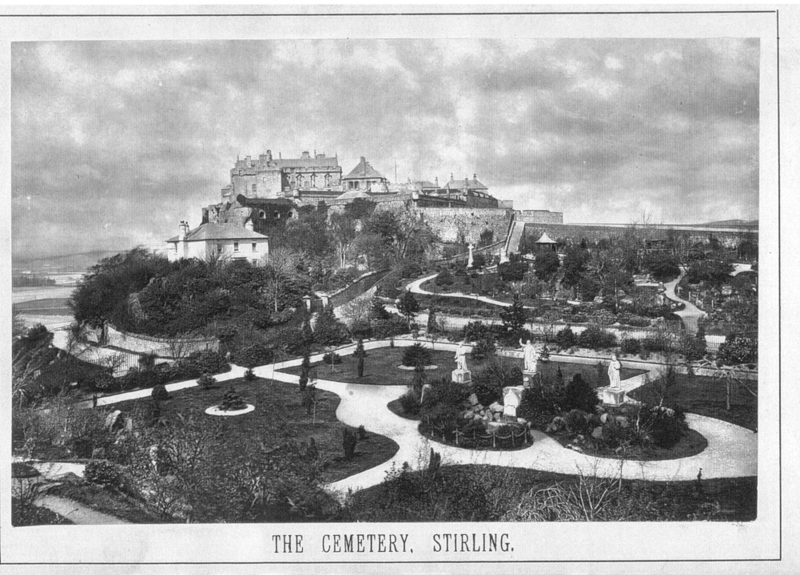 The Stirling design served other purposes beside burial. The paths linked to the castle and to the main tourist walkways round the town, such as the old Back Walk. And the statues of Presbyterian heroes and heroines added an ‘educational’ and ‘improving’ dimension. This was recognition that numbers of tourists were growing following the arrival of the railway in 1849. For most of these visitors the castle was the main object of interest but there was a clear need to provide other things for them to do. For a time there were even cemetery guides to explain the main points of interest. The Valley Rock Fountain supplied drinking water. But this was also intended to be symbolic or ‘spiritual’ water to refresh the soul as well as the body. Consistent with the overall message of the Valley, it springs from the feet of three key Presbyterian teachers. These statues, like the others, were sponsored by ardent local Presbyterians, particularly William Drummond. 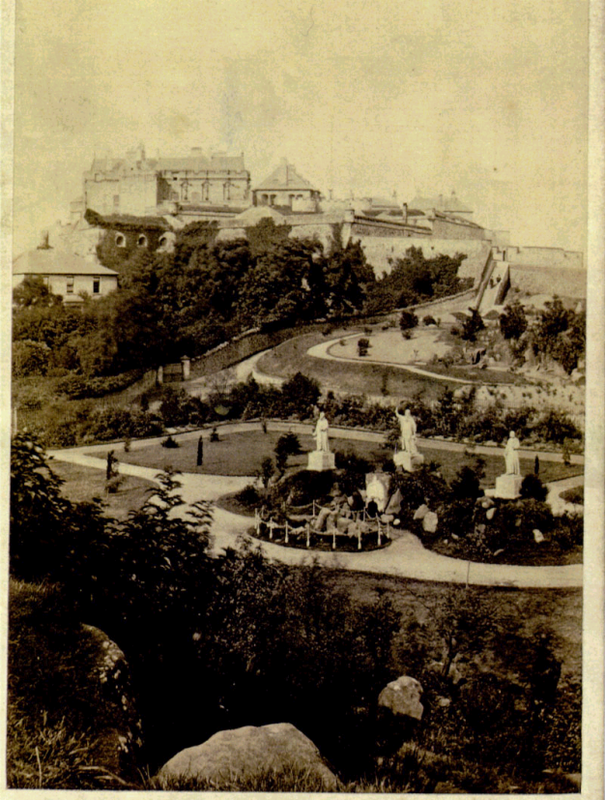 The Valley in the 1860s with statues and linked paths; the thee statues to centre right dominate the Valley Rock Fountain. Statues of Knox, Melville and Henderson at the Valley Rock Fountain. Their central location symbolises their key roles as leaders of three major stages of the emergence of Presbyterian church government in Scotland. 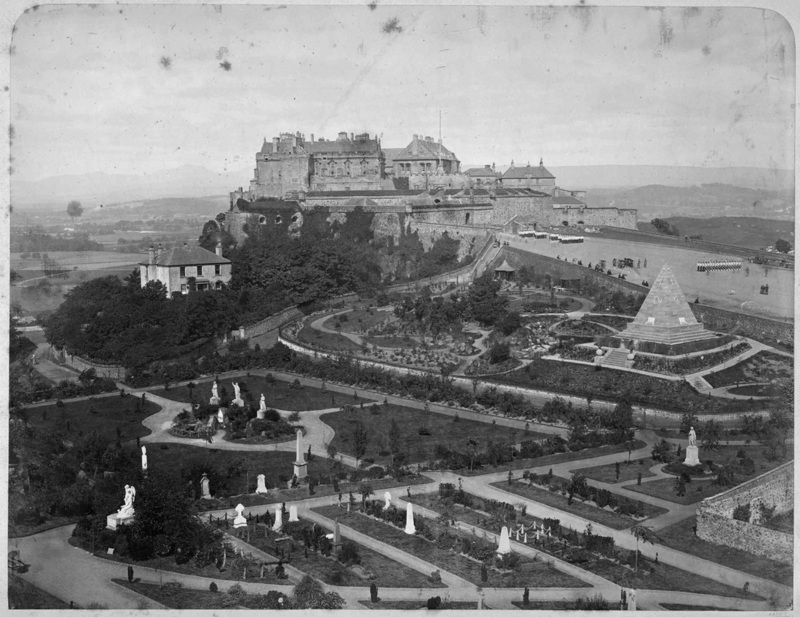 The Valley in the later nineteenth century with its regular paths and statues; the areas at the far end round the Valley Rock Fountain, was still devoid of gravestones. for the pyramid as well as the statues and who is buried beside it.